Algodon is Spanish for Cotton. My six cotton plants have been producing bolls ready for picking every couple of days. And I was very surprised at how these sparse little plants just keep on flowering, with the promise of more cotton bolls to come. 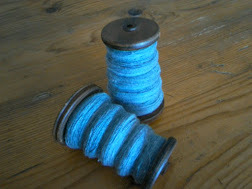 I am fast becoming a fan of cotton when it comes to spinning. Firstly, the preparation of the bolls, although almost as labour intensive as wool, is not as dirty. I do have to watch carefully though to pick at just the right time. At first the boll is quite tightly packed and barely open, it is possible to squeeze out the cotton at this stage but it feels damp and is a hard little wad of 'cotton wool' that needs to dry a bit before teasing out. It is better to wait until it bursts open more fully and then the cotton drys itself out... however if you leave it too long the wind starts to blow it away and you have lost your crop! I am spinning directly from the seed. The staple length is in places only about a quarter of an inch, with none of it more than an inch, it is quite a challenge after the merino wool. The spinning is slow and careful and takes practice to determine how much twist (lots) and how much draw (very little) and the concentration required is immense. 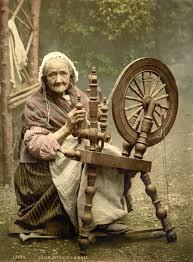 The wheel turns, there is a slight creak to it, and a gentle 'clack' sound as the flyer spins round, it's rhythmic and soothing, the thread grows inch by inch. The time just flies by and I hardly notice. What did I think about while I was spinning? I must have been thinking about something, I couldn't tell you what. As a single thread it is not very strong so I am planning on plying two together, this means that there isn't going to be a lot of thread but I hope there will be enough to do something with it. I could have enough to knit or crochet a flower, perhaps to wear as a brooch, but it will be all white - unless I dye it...or paint it. 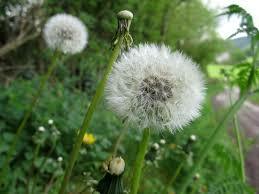 Or I could use it as embroidery thread and embroider white on white - pillow case perhaps. I could crochet a lace edging, a small lace edging. A universe of possibilities suggest themselves. I am sure that the end use will make itself known to me in due course, it could be something quite frivolous which is not like me. I usually go for practicality and usefulness. I will let you know when I know myself. One thing I do know, next year I shall plant allot more cotton (and feed the plants more so they grow taller) and they are pretty enough to plant in the flower bed rather than the veggie patch so I can keep an eye on them better.